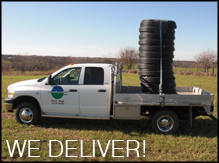 Call us today for our delivery schedule! What is the typical life span of Geothermal Heating/Cooling Installation? A furnace will 25 years and piping will last 50 years. What is the payback period on a Geothermal System vs. a conventional gas or electric system? The answer to this varies depending on utility rebates, current source of heating/cooling, climate in which it is being installed, and cost of installation (vertical, horizontal, pond). A typical installation is 3 to 5 years. Are Geothermal Systems only effective in new construction? These systems are typically more efficient in new construction because of the tighter design of the home, but they are also a superior option when replacing the heating/cooling system in an existing home/building. How do Geothermal and Radiant systems perform in extreme heat or cold temperatures? These systems are effective in all climates. The design of the systems ultimately determines the effectiveness of the system. Typically buildings with geothermal and/or radiant floor heating do not have cold or hot spots. How much digging would need to be done for this installation? Varies, depending on the heating and cooling requirements of the facility and the type of installation (i.e. Vertical, Horizontal, pond). When the life of the geothermal furnace is over, do the exterior loop need to be replaced? No. Generally speaking your loops can be effective for the lifespan of 3 to 4 furnaces. A new furnace can be installed to existing loops with minimal changes to the piping system. After the loops are installed, can a structure such as a garage or shed be built over top of them? Yes. The loops are typically installed a minimum of 5 foot below the ground surface and do not need to be accessible after installation and testing is complete. ReBearth Products, Inc. © 2007-2010 | Contact Us.